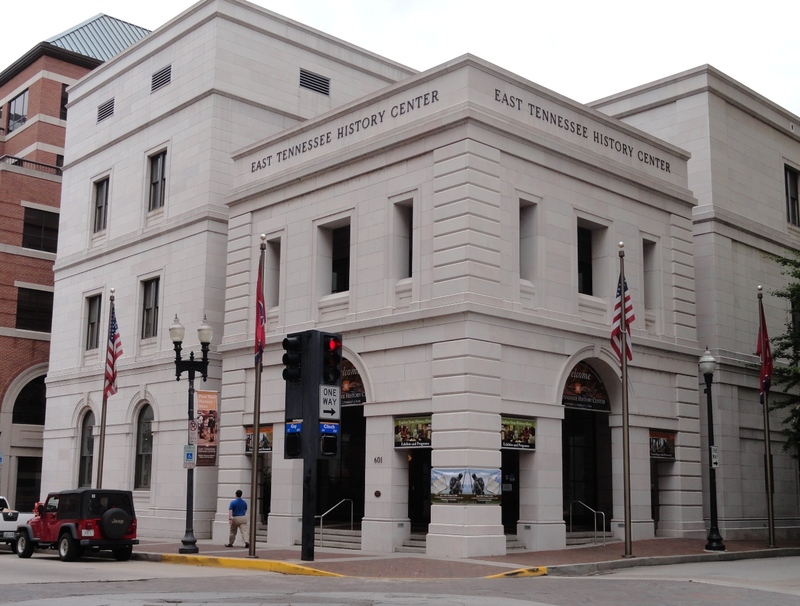 Yesterday, thanks to Eric Head and his co-workers, I was treated to a wonderful behind-the-scenes tour of the East Tennessee History Center in Knoxville, TN. Where to begin? 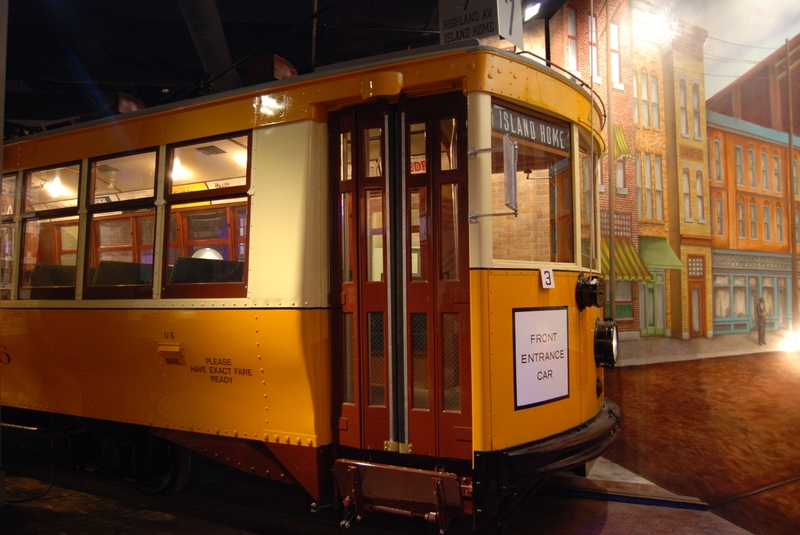 The History Center was built in three phases. The first phase, off camera to the right, was a post office and customs building from the 1800s. The middle section was a 1910 expansion to the courthouse. 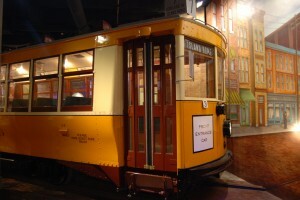 The front section is new. 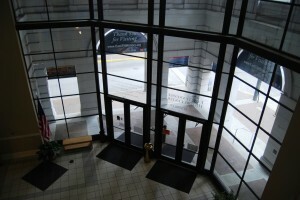 There are three public floors to the center. 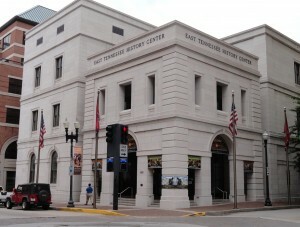 The first floor is a museum and gift shop run by the East Tennessee Historical Society (ETHS), who does a marvelous job. The second floor is home to the Knox County Archives. 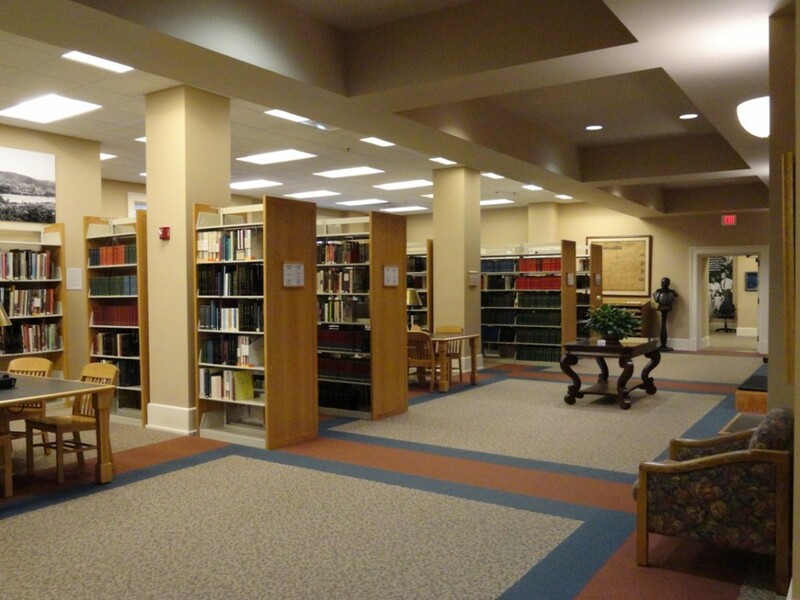 The top floor is inhabited by the Calvin M. McClung Historical Collection, a genealogical, local history, and special collections library that is part of the Knox County Public Library system. I also got to tour the two basements and all of the employee and storage spaces. Beautiful! 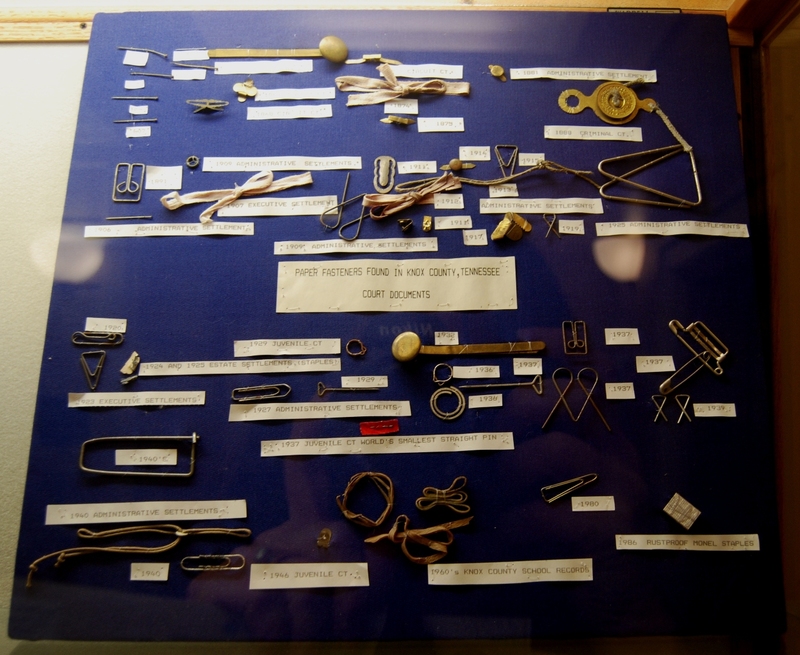 I waited for Eric on the second floor balcony and noticed a display case with an interesting exhibit: paper fasteners found on court documents from as far back as the 1870s. I love this kind of thing. I think the world’s largest brad was in this case! We went to the basement to look at the storage of original court records from Knox County. Eric showed me where new shelves will go and where some of the really interesting records are shelved. 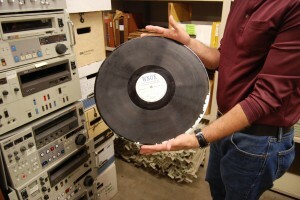 Below is a picture of the oldest record in the archives. Book “0” from 1792. 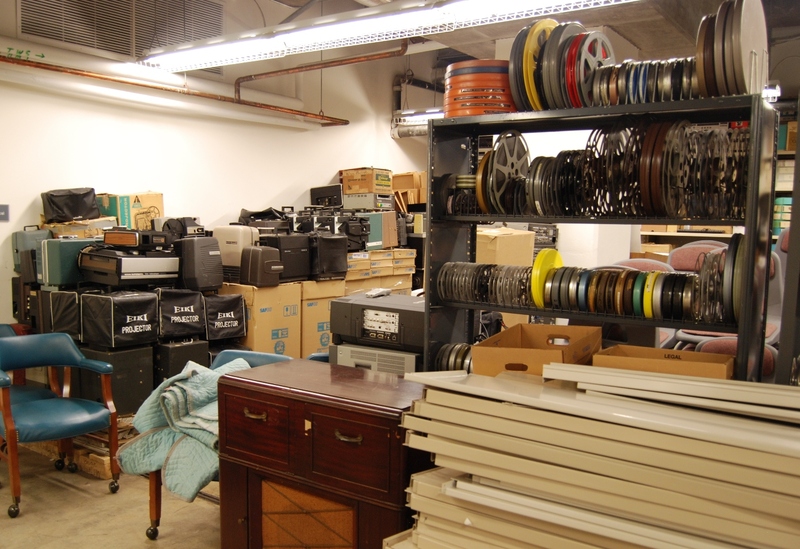 I confess that from this point on in the tour, I rarely knew which basement floor I was on as we went up and down the freight elevator and the employee elevator and wandered through back halls and aisles of shelving. Let’s just say…. I was in the basement and that for security reasons I’m going to be a bit vague about location. Yeah. Brad Reeves is the AV conservator for TAMIS and the McClung Collection. He has pro-actively gone about acquiring the recordings and documentation of the music, television, radio and oral history of the region. I asked him to point out one favorite piece of memorabilia and this expression was his answer! 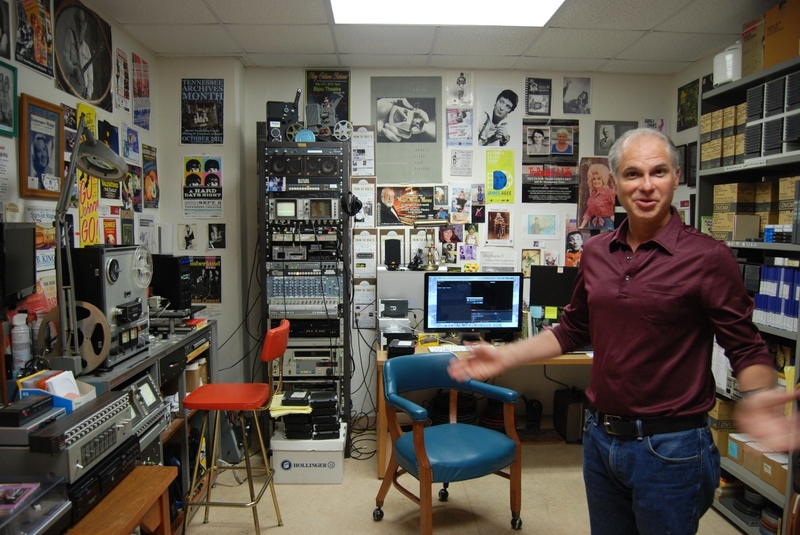 Brad collects every kind of projector and player he comes across so that he always has a way to play archival media. There is double this amount around the corner! At this point, Eric went upstairs to work the patron desk and Brad took over the tour. 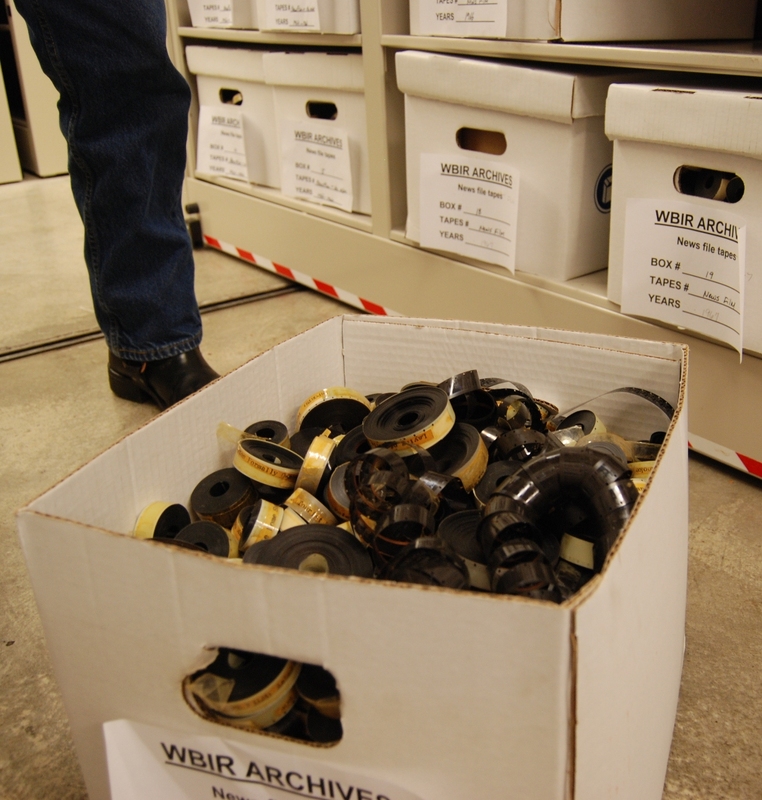 We discussed digitization, repair, acquisition methods, storage (brr), and many other things. Salvaged media from station WBIR. The old format for recording radio broadcasts. It’s the biggest “record” I’ve ever seen. 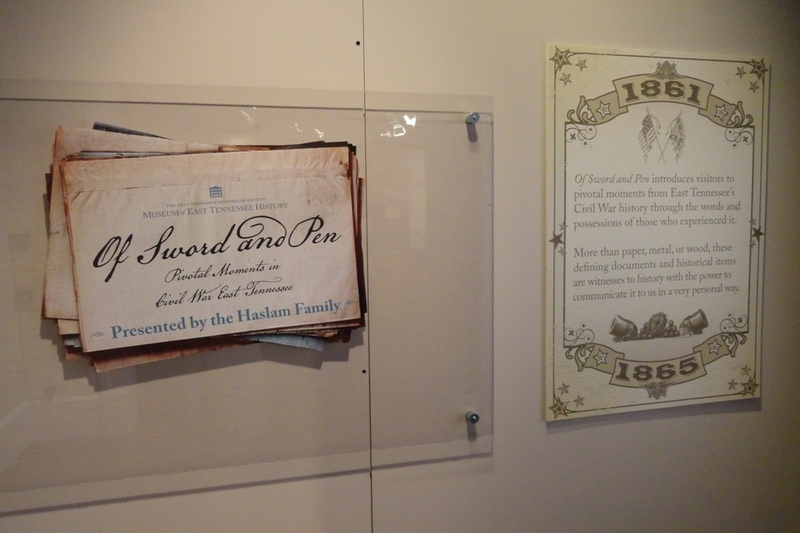 I spent the next part of my visit on the first floor to tour ETHS’ Voices of the Land signature exhibit and also the Civil War exhibit, Of Sword and Pen. 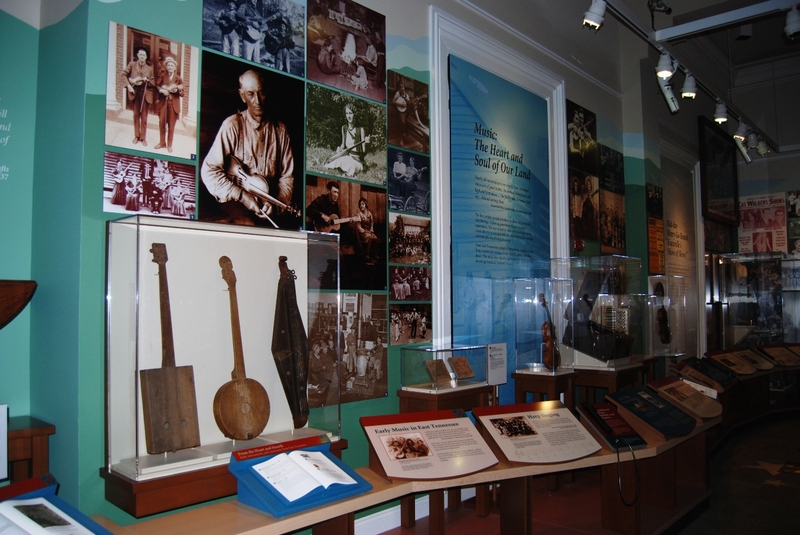 Starting with the native inhabitants of the land, the exhibit covers the early settlers, wars, industrialization, and culture. 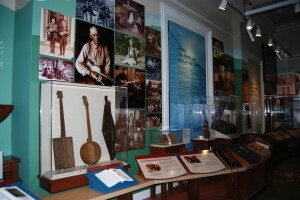 The exhibit is extensive. Here are just a few images. The Civil War exhibit was unique in that it was based on written documents, such as ballots, speeches, letters, diaries, journals and sketches. It is definitely worth a visit to Knoxville and is what inspired my whole trip in the first place. 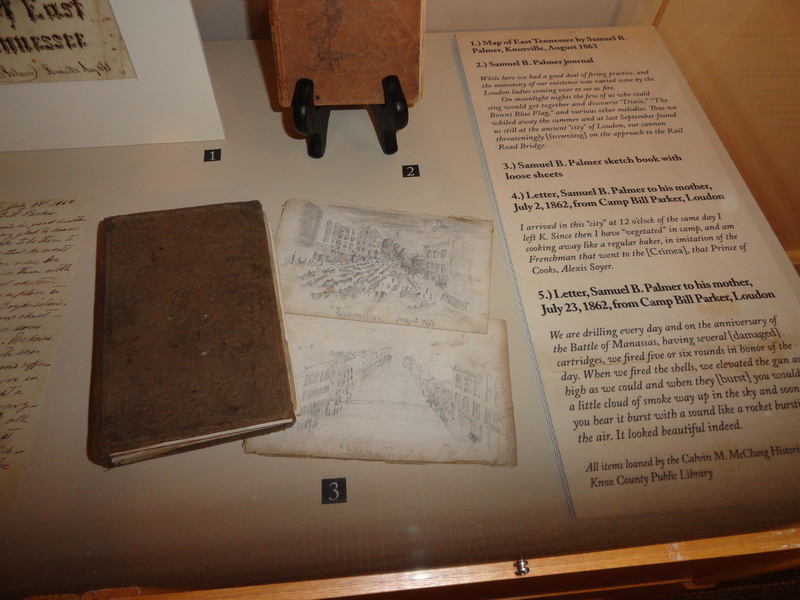 My favorite items were the drawings of Confederate prisoner of war Samuel B. Palmer. They display beauty, patience, detail and elegance during a time of ugliness. I was delightfully surprised, however, to also learn about the care required to exhibit primary materials. 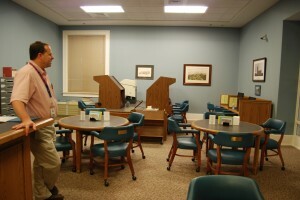 I will definitely do a better job of creating an exhibit for the Kingsport Archives, next time. 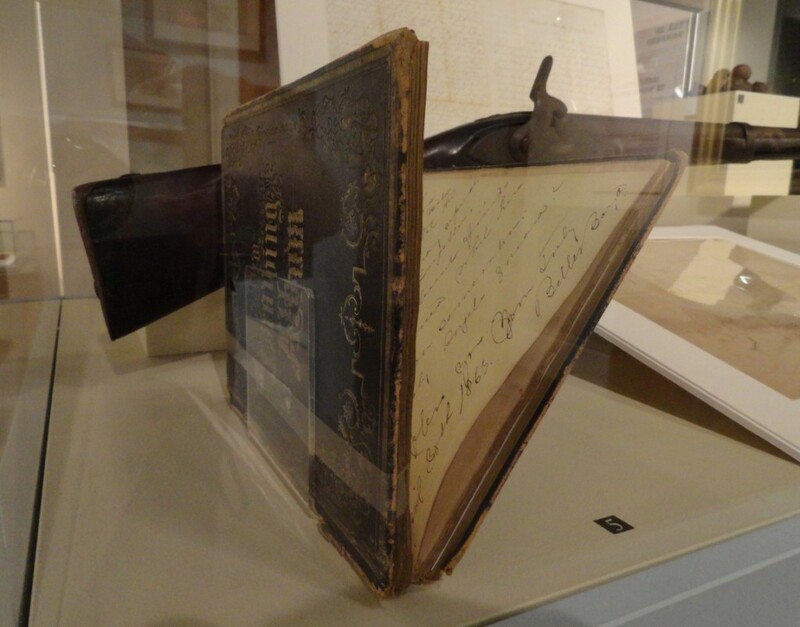 Notice the handmade book rest made of archival board. 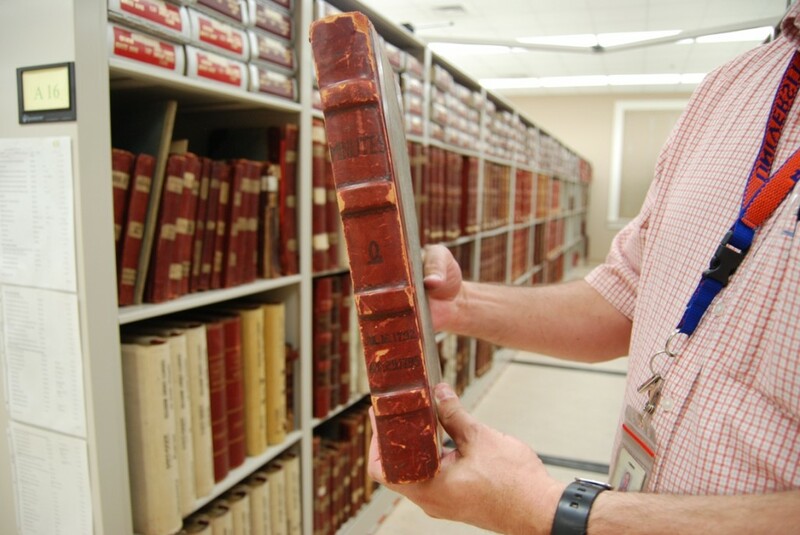 It keeps the journal open to the desired page while protecting the volume’s spine. 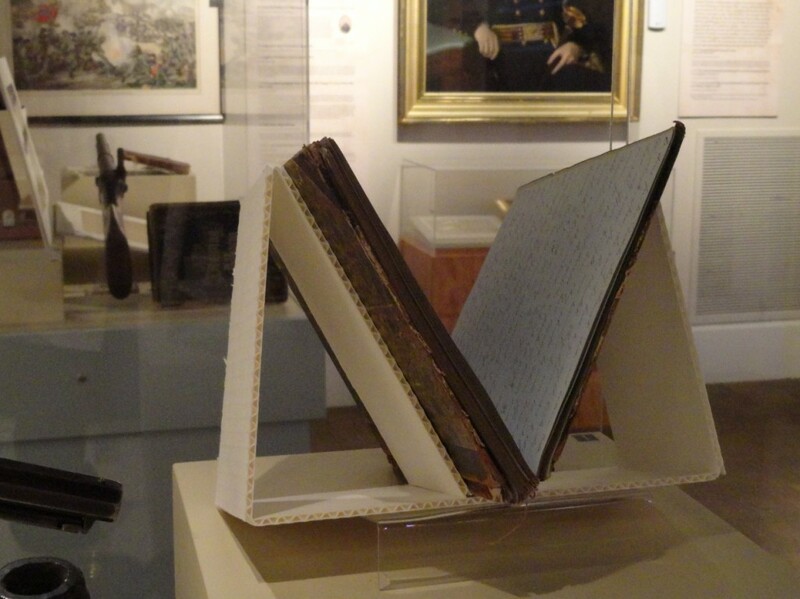 This book required even more delicacy, so the curator used a plastic band to secure the open pages to the stand, itself, without any adhesive touching the book. My tour of the McClung, given by veteran librarian Ted Baehr, was all-access. The library is so impressive it made me wish I had ancestors from the south just so I could do research in this beautiful setting with such knowledgeable staff. 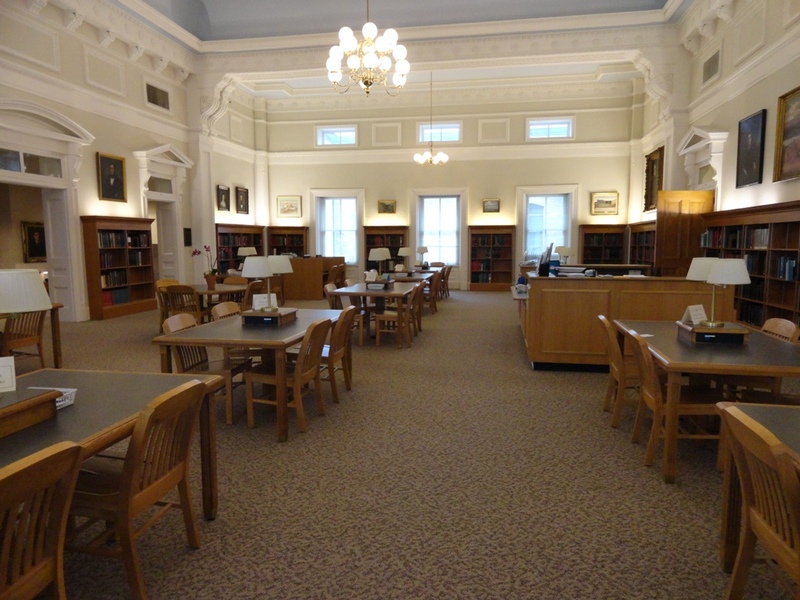 I was shown the classroom, the closed reading room, the open reference collection and patron areas, archival storage, offices, staff work and break areas, architectural features of the building, the map room, and so much more. I wish I could have videotaped the hour+ orientation. Magnificent. GO! Just a fraction of the reading area and reference collection. All of the walls are covered in original art. The old courtroom turned research room. Beautiful. I was sent on my way with lots of lovely parting gifts. Everybody was so great. 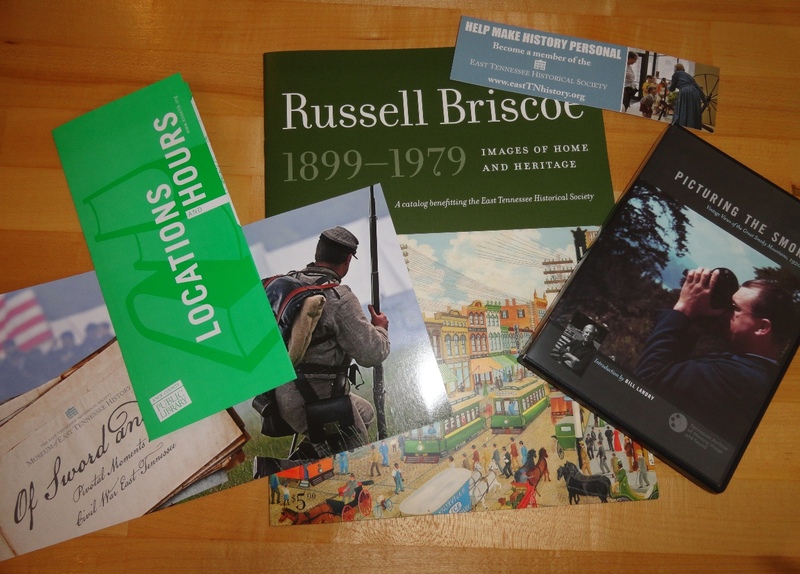 I hope you will find a reason to go to the East Tennessee History Center. Your visit only needs to be half as positive as mine to be a fantastic experience. Thank you, again, to Eric, Brad, Ted and everyone. This entry was posted in Field Trip and tagged audiovisual, conservation, genealogy, Knoxville, reference, research. Bookmark the permalink. We all enjoyed your visit…and thanks for the kind words!